Jack Holder on his way to another maximum against Berwick. Modest Jack Holder insists he is merely part of a package working to perfection. The rising star has enjoyed an incredible month in Panthers’ colours. He amassed a staggering 78+1 points in six appearances for the city club during June. That mammoth tally included two home maximums as Holder went through the card in a SGB Championship KO Cup success against Scunthorpe and the second of two league victories over bottom side Berwick. “I can’t complain,” said Holder with typical understatement! “It’s the best run of form I’ve had in my career so far, but I know things can change quickly in this sport. “It’s just a case of staying level-headed and taking it a race at a time. “The bikes are going great, I’ve got some top people around me and I just go out there and do the business. “Any rider needs a good team behind him to do well and I have that. The fact I’m racing more is also helping me a lot. “I’ve only ridden in one league in the last two years and that’s not enough. The fact I’m doing the Premiership and Championship this year is really helping me. Holder is certainly doing that. 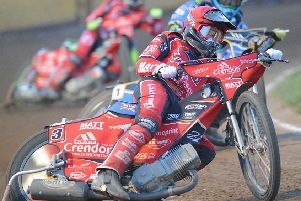 Only three opposition riders - David Howe of Berwick, top Sheffield man Josh Grajczonek and Glasgow reserve Jack Smith - have managed to beat the 21 year-old during his last five outings at the East of England Arena. And while track conditions are not always consistent at the city venue, Holder’s mechanical set-up certainly is. He added: “The track has probably been different for every one of those home meetings, but I’ve not changed a thing. “I’ve got a setup that’s working well so I’m sticking with it. Sometimes it’s just a case of riding a bit differently. “I hear a lot of people talking about how we need more dirt on the track, but I don’t agree with that. The track was much slicker against Glasgow and we had a great result. “Some of us like plenty of dirt, but we also have a couple of inexperienced riders in the team and have to find something that suits everyone. Holder is unsurprisingly Panthers’ highest-scoring rider this season. He has racked up 135+4 points in his 13 meetings to date and has won more than half (33) of his 59 races for the club. Three other men – Paul Starke, Ulrich Ostergaard and Bradley Wilson-Dean – have managed more than a century of points so far in 2017.